Important Revolutionary War view of the Great New York Fire of 1776. Representation du Fue Terrible a Nouvelle Yorck. The fire, which lasted two days, destroying nearly 500 buildings, at the time about one third of the city, broke out as American Revolutionary forces, under George Washington, and British marines, under Lord Howe, fought for control of the strategically important harbor. 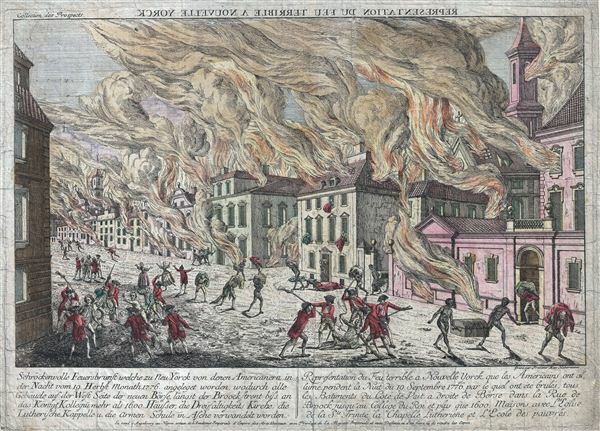 Both sides immediately accused the other of starting the fire intentionally, and indeed, when it became apparent that wresting control of New York harbor from the entrenched British was unlikely, the Revolutionary leaders did discuss burning the city to the ground, though supposedly the plan was abandoned. Nonetheless, the ramifications were significant, with the British using the fire as an excuse to maintain martial law over the city until finally expelled in 1783. This print was originally issued as a vue d'optique or lantern print. This type of print is meant to be projected and seen through an optic device, consequently the title, top center, is rendered as a mirror image. For this printing, French and German text decrying the fire as an act of revolutionary and slave aggression against rightful British hegemony, has been added to the base of the map. Drawn by the German engraver Franz Xaver Haberman, and published in 1776 by L'Academie Imperiale d'empire des Arts Libereaux, Augsburg, Germany, as part of a collection of views entitled Collection des Prospects. Franz Xaver Habermann (1721-1796) was a German engraver and artist active in the second half of the 18th century. Habermann was based in Augsburg where he was a well-respected engraver of urban views, particularly "vues d'optique" a type of lantern view rendered in reverse with the intention that it be viewed through an optic device. He is particularly known for his views of American cities, most specifically New York and Boston, which though merely artists conceptions and highly fictive, do illustrate the common European perception of the English colonies at the outset of the American Revolutionary War. Habermann's name occasionally appears in its French variant, "Francois Xav. Habermann" or more simplistically as "F. X. Haberman". Collection des Prospects (Augsburg) 1776. Cresswell, D. H., The American Revolution in drawings and prints; a checklist of 1765-1790 graphics in the Library of Congress, no. 268. New York Public Library, Miriam and Ira D. Wallach Division of Art, Prints and Photographs, The Eno collection of New York City Views, MEZN Eno 38d.